We are happy to announce that Maestra Lila and Maestro Damian will be running both our 13-day and 3-week Deep Immersion Ayahuasca Retreats in June. Both retreats offer a combination of traditional Amazonian plant-spirit healing with Shipibo healers complemented by a comprehensive program of progressive therapeutic and Eastern psycho-spiritual practices to support effective processing and long-lasting integration. 13-Day Ayahuasca Retreat from June 10th to 22nd and costs $1,500. 3-Week Ayahuasca Retreat from June 10th to July 2nd and costs $2,950. 1) An Ayahuasca/Plant-Spirit Shamanism Retreat: with 4 ceremonies on 13-day retreat and 8 ceremonies on the 3-week retreat. Intimate ceremonies limited to only 12 participants led by two Shipibo healers (one male and one female). 2) A Yoga Retreat: with daily classes lead by experienced teachers. 3) A Meditation Retreat: with regular guided meditations lead by experienced teachers and daily sittings. 4) A Self-Development Retreat: with particular focus on self-inquiry, self-reflection and deep shadow work. 5) Additional Components to Support Healing and Integration: all the above is combined with art therapy, dance and movement classes, singing, individual consultations, group processing meetings, time to reflect in the Temple grounds, floral baths, steam baths, traditional plant remedies, and vomitivos. Lila was also born in the Shipibo community of Roaboya , but grew up with her grandparents on her father’s side, who were well-respected Onanyas. At the age of 13, she became bed-ridden with a chronic infection for over a year. She had moved to live with and be cared for by her mother, Maestra Ynes, who started her on a dieta with catahua, a powerful medicinal tree. The dieta succeeded in curing her leg, and was the gateway for her path as an Onanya to open. However, Lila initially resisted the calling , in favour of leading a ‘normal’ life, but after having two children, the plants persisted in ‘calling her back’ to work with them. 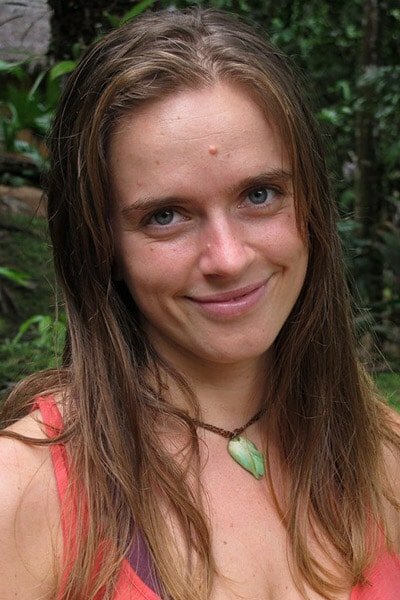 For the last 12 years, she has worked with her mother and other extremely well respected healers all over Peru. She came to work with us at the Temple in 2015 and has developed a reputation for her incredible range of warmé ikaros; songs of the plants focused on relationships, connection and joy. Lila exudes an amazing amount of love and care, and has become treasured member of our team of Shipibo healers. Like many other healers, Damian’s path to the medicine began with a personal health crisis. He studied and taught as a teacher in schools in the Iparia district for a time before falling gravely ill. His uncle, a plant-spirit healer took him under his wing in another community, and along with his grandfather, also a healer, worked together to heal him. It took five years of arduous plant dietas to eventually heal his illness, during which time he learnt an incredible amount from the plants about his own healing process, and consequently, how to heal others. He started to work as an ‘assistant’ curandero with his uncle, and when he died, with his grandfather for some years, until the local pastor convinced him that working with the plants was against his religion. As a result, he parted ways with the plants for around four years, got married and had his first children. During this time, the plants kept calling him back to work with them, which he ignored, and as a result, he fell ill once more. Fifteen years ago his grandfather helped him heal with the plants once again, and after making peace about his heart’s calling to heal others, he began working again as a curandero. Having been through much suffering himself and following a sincere calling to help others, Damian brings an open heart and deep commitment to his work as an Onanya. He is a real gift to our team. Jennifer is from British Colombia, Canada, and first started working with the medicine in 2008 and joined us at the Temple in 2011. Her commitment to the study and practice of yoga and psycho-spiritual integration have been integral elements to the deep personal healing and transformation that she has undergone in her journey with the plants. Jennifer began practicing yoga in 2004. In 2006, she undertook a 250-hour yoga teacher training in Victoria, BC. In 2013, Jennifer completed a two-year, 500-hour advanced teacher training with the Insight Yoga Institute, founded by Ty and Sarah Powers, which fuses principles of yoga, Buddhism and psychology. One of her primary teachers is Jennifer Welwood. Jennifer Teaches a number of different classes at the temple, mainly within the Deep Immersion Program, including Hatha Yoga, Yin Yoga, Nada Yoga, Meditation and Self-Inquiry. Her classes blend the treads of these ancient wisdom traditions in a down-to-earth way that inspires taking each moment of life as opportunity for learning and practice. Jason has always had a curiosity for life which has led him across the world and drawn him to many practices over the years, such as Yoga, Taiji, Qigong, Vipassana, Aikido, Muay, and Jiujitsu. Born in Sri Lanka to American parents and having travelled extensively since a young age, Jason became drawn to learning about the ways of the world. His curiosity eventually led him to the Amazon in 2012 where he began to work with plants and learn traditional ways of healing. His experience combines many different modalities of working with a variety plant medicines and teachers. He approaches his work at the Temple as he approaches his work with plants – with respect, humility, and a genuine desire to learn, so that doors can be opened in life and to healing on all levels. Jason works as a facilitator, as a teacher of meditation, yoga, and martial arts, and offers ceremonies and dietas working with tobacco. These ayahuasca retreats focus on teaching and practicing key elements to ground medicine work through a variety of processing and integration techniques. Guided by dedicated, highly skilled and experienced healers, facilitators and teachers, we present an incredible opportunity to come to the Temple and experience these ground-breaking programs.